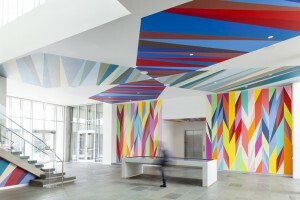 Odili Odita SCAD MOA lobby final documentation. SCAD MOA. 01/08/13. Shot by Matthew McCully. As part of Mural Arts’ Open Source program, Odili Donald Odita creates a mural that addresses the social struggles faced by Philadelphians. Odita’s vibrant colors and patterns explore the vital role local community and cultural organizations play in keeping a city thriving. The exhibition originally scheduled at Brandywine Workshop has been cancelled. Mural Arts’ Open Source: Engaging Audiences in Public Space is a groundbreaking outdoor exhibition of temporary, site-specific art created by leading contemporary artists.